IT managers may be feeling a bit of déjà vu these days. Shortly after meeting last April’s deadline to migrate desktop PCs off the stable, but outdated, Windows XP operating system (OS), they’re now facing a new deadline: Microsoft will no longer support the workhorse Windows Server 2003 R2 after July 14, 2015. Following that date, users won’t receive patches or security updates, leaving machines open to new cyberattacks. Some experts estimate that as many as 10 million machines will still be running the OS when the deadline hits. 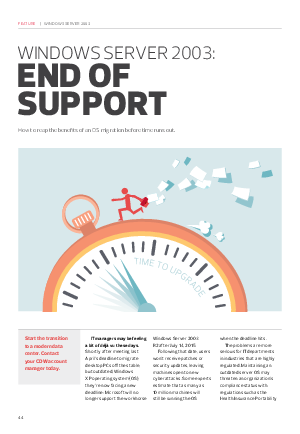 With support for Windows Server 2003 R2 waning and a host of practical reasons for migrating, how can IT managers put an effective upgrade plan into practice?